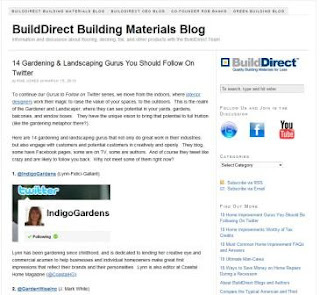 My friend Rob Jones at BuildDirect has started a wonderful series highlighting Gurus To Follow On Twitter. The most recent - 14 Gardening and Landscaping Gurus You Should Follow On Twitter - seems particularly relevant given that it's St. Patrick's Day. So, check out Rob's Gardening and Landscaping Gurus - including those listed in the comments. If the outdoors become too overwhelming, I suggest you recharge indoors with Rob's 12 Interior Design Gurus To Follow and 10 Home Improvement Gurus To Follow. Thanks, Rob, for the inspiration and the great resources! If there are others you'd add to these lists, let me or Rob know. It's that time of year again... to consider Carpet Style Trends for 2010. More specifically, with a focus on 'upbeat' design and color. One from Floor Covering News dated January 25/February 1, 2010 titled Color splashes into 2010 styles. The other from Floor Covering Weekly dated January 4-18, 2010, titled "Style watch: Surprisingly upbeat designs, colors". Yes, both articles mention how, in tough times, consumers tend to gravitate toward safe flooring choices. They also both call attention to color, pattern and design to banish the doom and gloom and bring joy, energy and enthusiasm back. The carpet photos above comes from the Wynn in Las Vegas. I couldn't help admiring it. It filled me with warmth and delight. Isn't that the kind of effect - perhaps not with the same color palette or design scheme - that you'd like to create in your home? The Color splashes article refers to "bold colors with dramatic, over-sized patterns... in an almost out of context scale". How better to "break free from the doldrums"? The Style Watch article details interesting color trends that gravitate around "vintage, reused and recycled material." Brings to my mind the notion of everything old is new again. Even though both "color [and] pattern [are] showing restraint", consumers are nonetheless looking beyond beige and safe. With patterns, they are leaning toward small to medium scale patterns, organic designs, animal prints as well as contemporary, geometric and organic patterns. I see small scale and organic patterns in the image above, don't you? I love the ending of the article: "...the downturn has caused everyone to look at things in a whole new way... We have a new appreciation for things. The downturn has given us a chance to turn inward and try new things we wouldn't have..."
How are you looking to infuse that new appreciation in the carpet style trends you're considering?